It’s May 4, Star Wars Day, a dedicated to what is perhaps the most mainstream dad joke of them all. Happily, the day is redeemed by Steam’s Star Wars sale, which offers hefty discounts on more Star Wars games than I even knew existed. 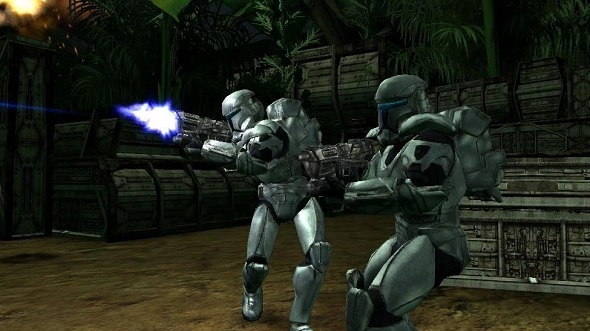 Star Wars Episode 1: Racer has just come to GOG – in case Steam doesn’t have enough on offer. If you’re looking for the complete experience, your best bet is the Star Wars Complete Collection. It contains 24 games in total, from Rebel Assault all the way up to Star Wars: Battlefront 2 (the good one) via a healthy smattering of X-Wing and LEGO games. You can pick the bundle up for £55.71, down 72%. If that many games at once is an alarming prospect, there are a few smaller bundles available; there’s the Classic Collection at 71% off; the entire X-Wing series for 70% off, and the Jedi Knight Collections, which includes Dark Forces and Jedi Academy, among others, at 75% off. If none of those bundles catch your eye, all of the games in the complete collection are available by themselves. They’re all on sale for at least 50%, meaning you can get pretty much any game on this list of good games for around a fiver. The only exception is Lego Star Wars: The Force Awakens, which is available for £8.24, a 75% discount. The Star Wars sale will run all weekend, coming to an end on May 8.